Nestled at the end of a quiet street, this home is ideal for families to enjoy and relax in comfort away from the hustle and bustle of the summer crowds. It is centrally located on the island so easy walking to beaches, vineyards, Saturday market, cafes and restaurants. There are 2 separate living spaces. The Main House has 2 bedrooms, a recently renovated bathroom and a modern, open-plan kitchen and dining area. There are stunning water views from this stylish, contemporary, modern home. Upstairs, above the garage, is the Studio which has a bedroom with an ensuite bathroom with shower and toilet, a large sunny, colourful lounge and kitchen. The balcony looks out over the treetops to the bays below. The Main House has decks wrapping around it on all sides providing sun traps to sit and enjoy the garden. The section is flat and fully fenced and is safe for children. There is a trampoline in the garden under a spreading olive tree. Barbeques are on the decks - cook and watch the sun go down over the hills and Putiki Bay. This is a great house for entertaining. It is just a 2 minute walk to a secluded beach with a jetty to dive off and pohutakawa trees for shade in the summer. This is a hidden gem on Waiheke Island. Walk to the other end of Shelly Beach Road and swim at lovely Shelly Beach. 2 Kayaks are available for guests to use for free. Putiki Bay is a beautiful bay to explore by kayak and safe for children and people new to kayaking. Oneroa village is a 5 minute drive away. Buses leave for both ends of the island from the bus stop at the end of the street. Rent our electric bikes (1 lady’s bike, 1 man’s bike), subject to availability. This a great way to get around Waiheke Island, flattens the hills of Waiheke! $20 per day, per bike. House and studio together sleep 6-8. 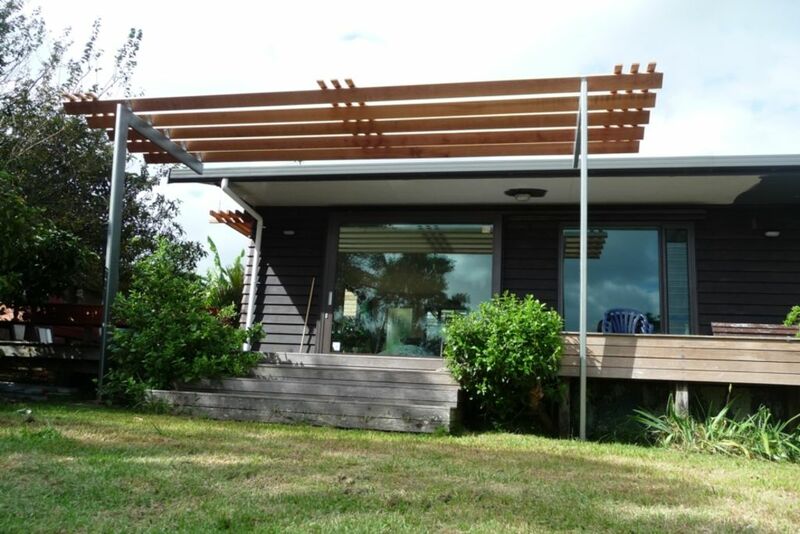 We enjoyed our stay at Shelly beach Home and Studio - loved the view and the quiet garden, having the sun all day made it very special, it is a cosy home and relaxing spot. All tide beaches are only 5 minutes drive so it is easy to visit a different corner of Waiheke very day - come back for lunch - have a rest - and be off again for another swim. The property on Waiheke is so lovely. The property on Waiheke is so lovely. We had a wonderful stay and couldn't recommend it more. The living room has a sliding door so you can sit on the sofa and look out over the water. It was a beautiful and relaxing house to stay in and we had everything we needed. Thank you for having us! I couldn't recommend it more. We absolutely loved staying at this property. We absolutely loved staying at this property. The house was very accommodating with everything you needed to for a comfortable stay, even came with free kayaks and WIFI. The view from the backyard was beautiful and had a large grass yard to relax on. All in all this was a perfect place to stay and would recommend it to anyone ready to relax!